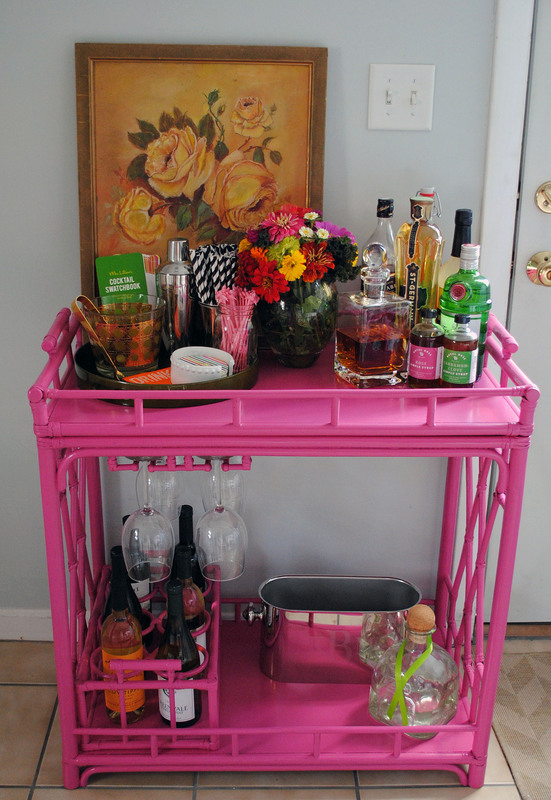 I finally got around to doing a little bit of styling of my new Society Social bar cart, it’s a work in progress, but I felt like it was time to share a few snaps of what I’m working with! I propped up a vintage painting that my parents gave us as a wedding gift, and culled together a bunch of pieces I already had scattered around our apartment, like a green lacquer tray from Target, my Kate Spade coasters (that coincidentally were a gift from Roxy of Society Social! 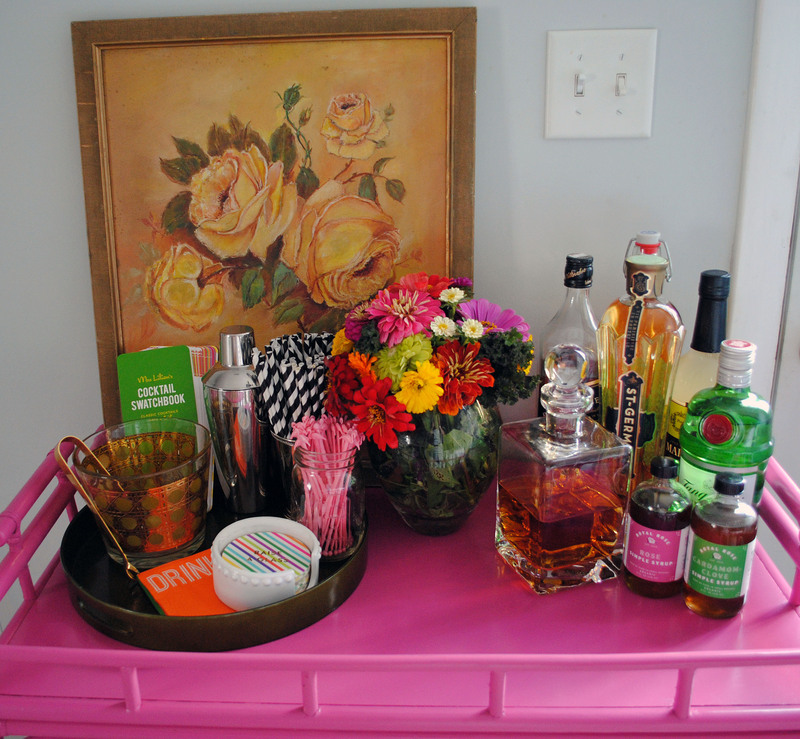 ), my Mrs Lilien Cocktail Book, and lots of little drink accessories, like striped straws and flamingo cocktail stirrers (what, you don’t have those lying around your house?). I also added my new ‘shake, rattle, and roll’ cocktail shaker which I get a total kick out of! I need to hang a few more pieces on the wall above it, and I’m hunting on Etsy for some more vintage barware, but it’s getting there! I get so excited every time I turn the corner now and see it as I walk into the apartment — it makes me so happy! Life has been a little crazy lately, which is why I’m posting a weekend review on a Tuesday and including highlights from the previous week. I was in NY for several days last week for work and for fun; my awesome co-workers know me so well and gifted me some very tasty macarons as a goodbye present (I’m starting a new job next week!). 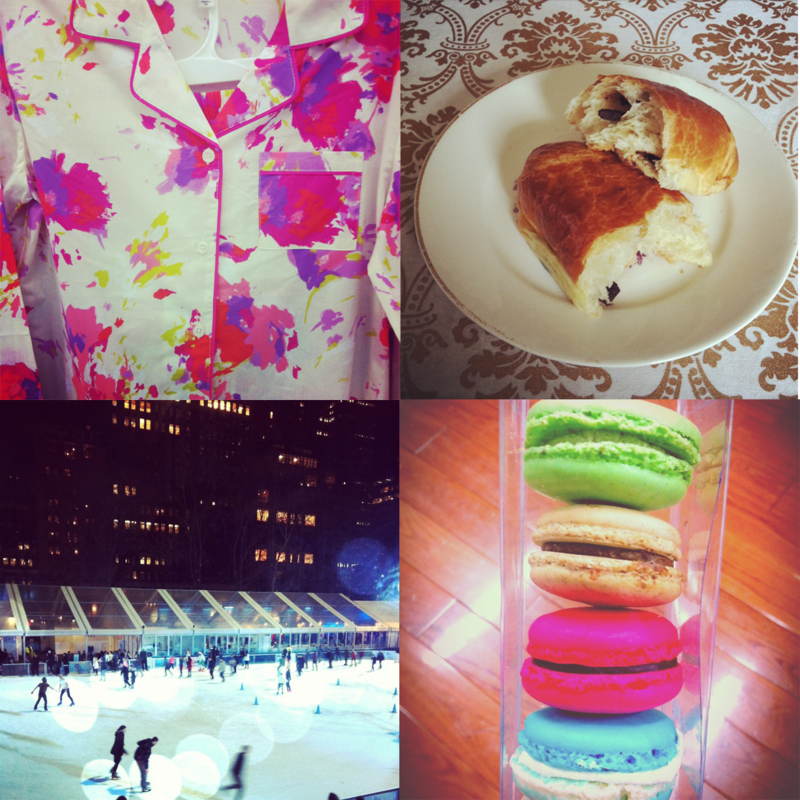 And while in NY I also got to visit with family and friends, which meant dinner overlooking Bryant Park, shopping with Mom (how cute are those PJs?) and a trip to the farmer’s market with my sister — where we skated past the veggie stand and honed in on the chocolate-stuffed croissants. I’m back now and am enjoying a few days off before I start the next chapter, which hopefully includes a little more time for updating this blog! I spent my day off tackling a list of home projects: first up was cleaning out our office closet where I was elbow-deep in holiday garlands and craft supplies. While there is nothing as satisfying as knowing exactly where every jar of glitter you own is stored, once the closet door closes there’s a little less excitement about that type of sprucing. 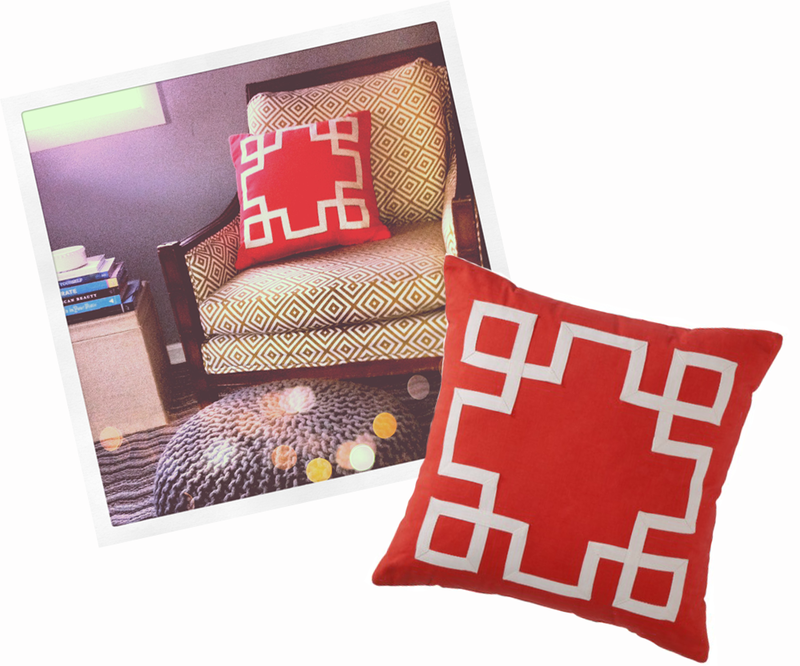 Luckily when my Mom visited this weekend to accompany us to our wedding tasting, she brought a big bag of belated birthday presents and in it, a new grosgrain applique pillow from Target — just the kind of visible sprucing I was looking for! Have you started your holiday shopping? 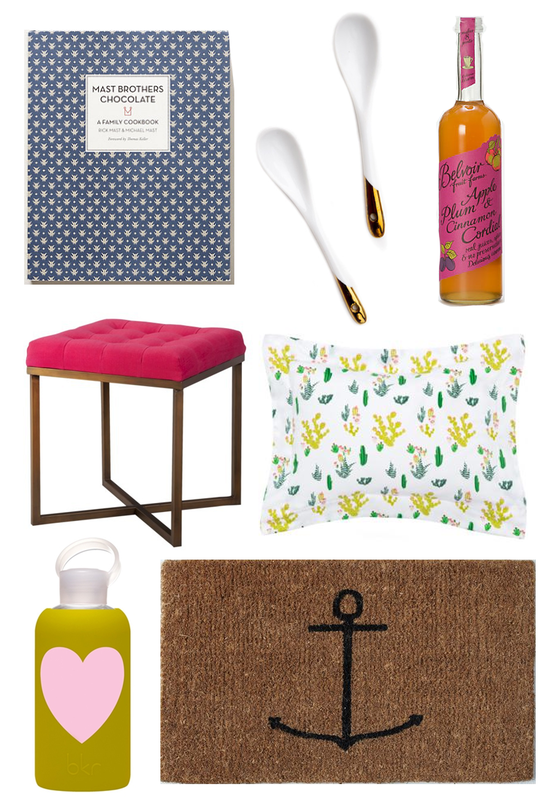 I’m kicking off a series of gift guides today organized in my very favorite way: by color! 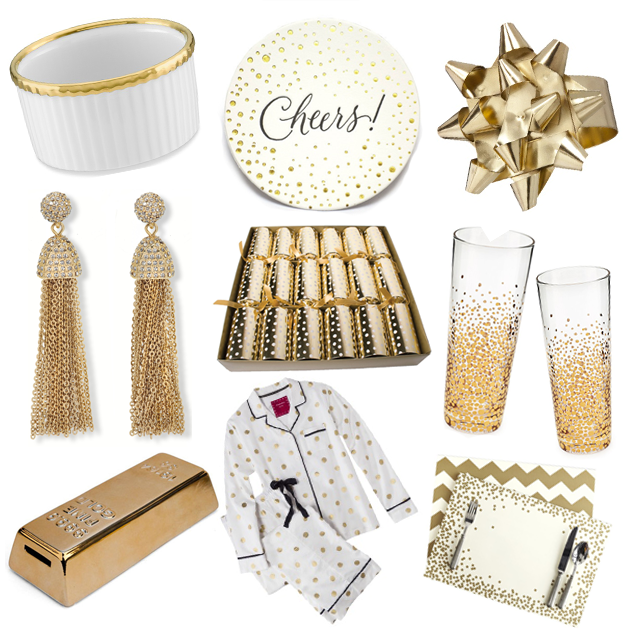 First up, a little bit of sparkle with gifts as good as gold. I was super lucky to be invited last night to a hear Designers Don Carney and John Ross share their inspiration and present a preview of their new Patch NYC line debuting at Target on September 9th. As a long time fan of kitschy woodland creatures, these pieces were right up my alley. I’ll be ready to line up at my local Tar-jay for a gorgeous feather serving plate and teapot and few quirky little owl candle holders. Check out more previews here.